Well, I really don't know where to start with this, gutted hardly begins to cover it. What the hell it must have been like for the Saints players, well, god only knows. Once again they had given absolutely everything in this game, previously underperforming players were excelling. Why on god's green earth did Saints not ditch the utterly hopeless Mauricio Pellegrino earlier? The real villain of the piece however, was the referee, the infamous Jonathon Moss. I usually groan inwardly when I see his name down for any Saints match, let alone one as important as this and he didn't disappoint. But let's not get ahead of ourselves. After the heady 2-1 win against Bournemouth, the tension was palpable as kick-off approached. Lose and relegation was out of our hands, a draw was just about as much as could be expected, but a win would be priceless. After the Bournemouth match Hughes opted to have a tougher midfield, replacing Redmond with Højbjerg. At the back it was as before with McCarthy, Cédric, Bednarek, Yoshida, Hoedt and Bertrand. The midfield was Romeu, Højbjerg and Lemina, with Tadić sitting slightly deeper than Austin up front. Saints started off the day's late game, knowing that Bournemouth had already beaten Swansea earlier in the afternoon and showed they meant business from the start. They were holding the ball well, but without actually threatening the Everton goal. The Toffees seemed to be playing in that end-of-season mindset, when teams have nothing to play for - otherwise known as being already 'on the beach'. On 20' Charlie Austin had a chance, when a cross from Cédric was headed out by a defender, but only as far as the Saints No.10, who caught the ball on the volley, but only succeeded in directing the ball into the grateful arms of the Everton goalie, Jordan Pickford. Shortly after Morgan Schneiderlin (remember him?!) fouled Austin and Saints wasted the resulting free kick with Bertrand unable to reach Tadić's pass on the left and the ball goes for a throw-in. Just about on the half-hour mark, Pickford was called into action again, when a long range shot from Romeu took a deflection off a defender and the goalie did well to reach the ball in time. Next came an example of how well McCarthy commands his area, when a Baines free kick, of the type that used to cause pandemonium in the Saints penalty area, was collected decisively and with the minimum of fuss by the Saints goalie. The only other thing of note in the first half was a booking for Charlie Austin, after he brought down Coleman from behind. The home crowd were not happy and booed, as the referee blew for half-time. So 0-0, but although Saints had the majority of the chances, they couldn't actually put the ball in the net. 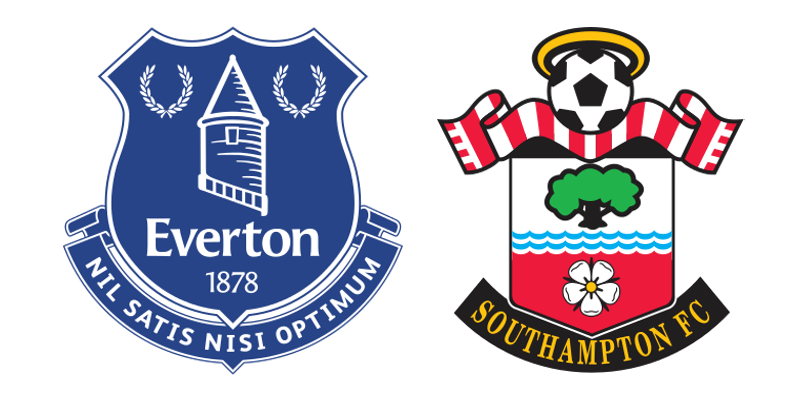 There were two changes before the start of the second half, Everton replaced Bolasie with Mori and Saints were forced to take off Lemina, who had clearly been struggling with what looked like a hamstring injury. In his place Hughes sent on Nathan Redmond. Romeu was the next Saints player to be booked by the referee, for a foul on Tosun. Then came Saints first corner of the game on 55', won by Bertrand as his cross was deflected out by Coleman. Tadić took the corner, but it was cleared by the defence. Almost straight away came the passage of play that led to what should have been the game winning goal on 56'. Tadić played in Cédric on the right, whose fantastic cross was met by the stooping head of Redmond. 0-1 and Redmond's first goal this season. Cue the Saints fans in the away block going mental. Immediately Allardyce took off Vlasic and sent on Niasse, who immediately made his presence felt. You could sense the dynamic of the game changing and Saints were desperate not to give this one away. By the 70th minute the tension had ratcheted up several notches and in quick succession Hughes then replaced Tadić with JWP and Austin with Shane Long, to bring on some fresh legs. Still Saints came forward and on 82' Hoedt passed down the line to Long, who sent a great pass to Redmond. Nathan strode forward and struck the ball firmly - right over the cross-bar. Then came the game changing moment. Maya Yoshida, having been booked earlier in the game collided with Niasse and was immediately shown a second yellow, followed by a red. Down to ten men with 6 minutes normal time left. A frantic last few minutes of normal time seemed to take forever and then the fourth official held up the board - 4 minutes. Cédric was down being treated for an injury and the Saints fans were urging the players on. Almost there! Cédric was back on his feet, but Hoedt gives away a free kick to stop Coleman getting past him. Baines takes the kick and just as it seems that it is destined for the top corner McCarthy leaps and manages to get his right hand up to tip the ball over!! The resulting corner is cleared by McCarthy who punches the ball away. 3 minutes gone! Nathan Redmond wins the ball cleanly, but Mr Moss decides that it should be a free kick. As if that wasn't bad enough, he allows Everton to move at least ten yards closer to the goal, before taking the kick. Davies strikes the ball hard and it hits Hoedt, deflecting it past McCarthy into the back of the net. 1-1. It felt like a kick in the guts. The sheer injustice of it all. In the 6th minute of 4 minutes added time. Cheers Jon Moss. Needless to say that was virtually the last kick of the game and at the final whistle the Saints players collapsed where they were, distraught. To be honest, it felt like a loss and I just hope and pray that those two points undeservedly snatched away at the death, will not be significant in the battle against relegation.